Vantage Vintage — Vintage Estate Jewelry, Antiques and Collectibles. 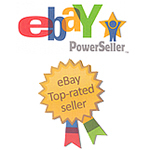 Vantage Vintage achieves eBay Top Rated Seller status! Our TRS status means you can expect the best service, prices and fast shipping. Go to our eBay store to see all the great items we have to offer. You can also check out a sample of our current items below. We add new items weekly, so check back often! We specialize in estate, vintage and antique items with a focus on jewelry. Our items come from public auctions, estate sales, flea markets, garage sales, thrift stores... you name it. We dig just about anywhere we think there may be treasure. Our primary hunting ground is Southeastern Pennsylvania, but the thrill of the chase takes us all over the Mid-Atlantic region. We never know what rare delights we'll find; luckily you can find them all right here.